The US pop art pioneer Robert Rauschenberg has died at the age of 82, his gallery said today. Rauschenberg - described as a "titan" of American art by the New York Times - died on Tuesday, Jennifer Joy, of the Pace Wildenstein gallery, in New York, said. He had been ill for some time. The artist was born in Port Arthur, Texas, in 1925, and spearheaded a style called the Combines in the 1950s. 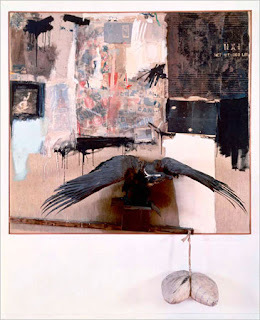 The style incorporated aspects of painting and sculpture, and Rauschenberg eventually moved on to include objects such as a stuffed eagle or goat and street signs. He became one of the most influential artists reacting against abstract expressionism. In the 1960s, he responded to the work of his pop art contemporaries - including Andy Warhol - by incorporating up to the minute photographed images in his works, including pictures of John F Kennedy. Rauschenberg began silk-screen painting and embarked on a period of more collaborative projects including performance art, choreography, set design and art and technology combinations. Among his most famous works was Bed, created after he woke up in the mood to paint but had no money for a canvas. His solution was to take the quilt off his bed and use paint, toothpaste and fingernail polish. In 1970, he established a permanent studio on Captiva island, off Florida's Gulf coast, where he made his home. He demonstrated the diversity of his work when he won a Grammy Award in 1984 for best album package for the Talking Heads album Speaking in Tongues. "I'm curious," he said in 1997, in one of the few interviews he granted in his later years. "It's very rewarding. I'm still discovering things every day." 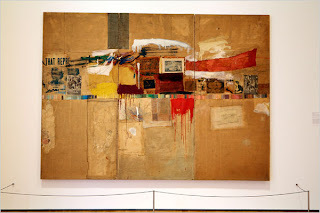 Rauschenberg's more than 50 years in art produced a varied and prolific collection that that filled both Manhattan locations of the Solomon R Guggenheim Museum during a 1998 retrospective. The Time magazine art critic, Robert Hughes, called Rauschenberg "a protean genius who showed America that all of life could be open to art ... he had a bigness of soul and a richness of temperament that recalled Walt Whitman".